“Contest Organizers” – means Ontario Centres of Excellence and the Ontario Ministry of Economic Development, Employment and Infrastructure. Young Entrepreneurs, Make Your Pitch is subject to the Freedom of Information and Protection of Privacy Act (“FIPPA”), which governs the collection, use, and disclosure of personal information. The Site collects Personal Information directly from the individual (student entrant or his/her guardian) to whom the Personal Information relates. Contest Organizer employees shall limit access to Personal Information to those individuals who have a need to know such information as necessary to administer the Contest. The Site may contain links to other websites. Contest Organizers are not responsible for the privacy practices of other websites. This Policy applies solely to information collected by the Contest Organizers in connection with the Contest. Contest Organizers collect use and disclose Personal Information as is necessary solely for the purposes of administering and promoting the Contest and contacting entrants about their Contest status if necessary. Contest Organizers collect, use, or disclose Personal Information only with the knowledge and consent of the applicant to whom the Personal Information relates, or with the knowledge and consent of his/her parent/guardian, except where required or permitted by law. Notice of Collection is provided at the time of collection of Personal Information. The Entrant or his/her guardian may withdraw his/her consent to the collection, use or disclosure of his/her Personal Information at any time, on reasonable notice. Withdrawing consent may result in withdrawal from the Contest. In the event that the Entrant or his/her guardian withdraws his/her consent, the Contest Organizers will erase the Entrant’s Personal Information from the Contest information bank, unless there is an overriding legal requirement to retain the information. The collection of Personal Information is limited to those purposes necessary for administering, promoting, and advertising the Contest and contacting Entrants. Contest Organizers do not use or disclose Personal Information for purposes other than those for which it was collected, except with the express consent of the Entrant or his/her guardian, or as required or permitted by law. Contest Organizers retain Personal Information as long as necessary to fulfil the Contest’s requirements, or as required by law. It is the responsibility of the Entrant to ensure that Personal Information is accurate, complete, and up to date. After the completion of the Contest, an Entrant or his/her guardian cannot access his/her Personal Information via the Site. An Entrant or his/her guardian may request a correction of his/her Personal Information where the individual believes there is an error. 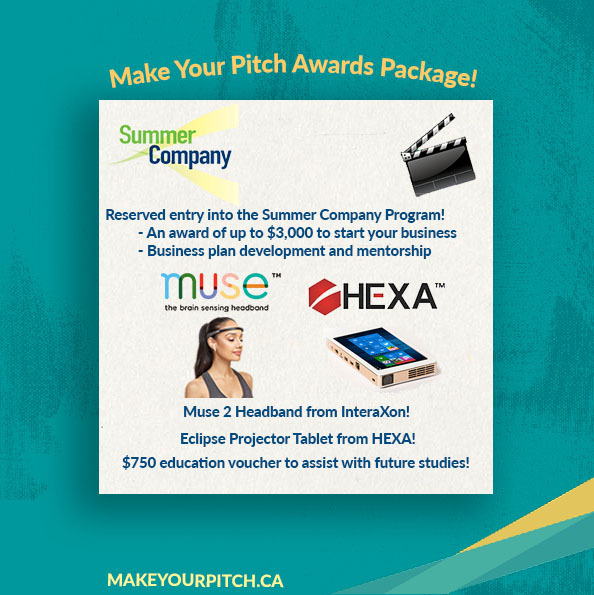 Requests to change Personal Information should be sent to: support@makeyourpitch.ca.